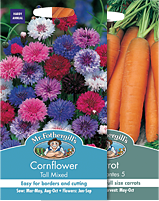 Our standard flower and vegetable packets make up the majority of our seed range. Flowers are denoted by a light blue key colour and vegetables by grey-green. The packets are designed to make product choice easy with the variety picture most prominent and only key information on the front. Full detailed information is given on the back including; quick reference guides, step by step culturals, hints and tips. Over the course of this season and next, we are adding the RHS Perfect for Pollinators logo to all approved varieties. For details of which varieties make up each of the Mr Fothergill's ranges, go to the Download page and look at the Collection Detail resource.